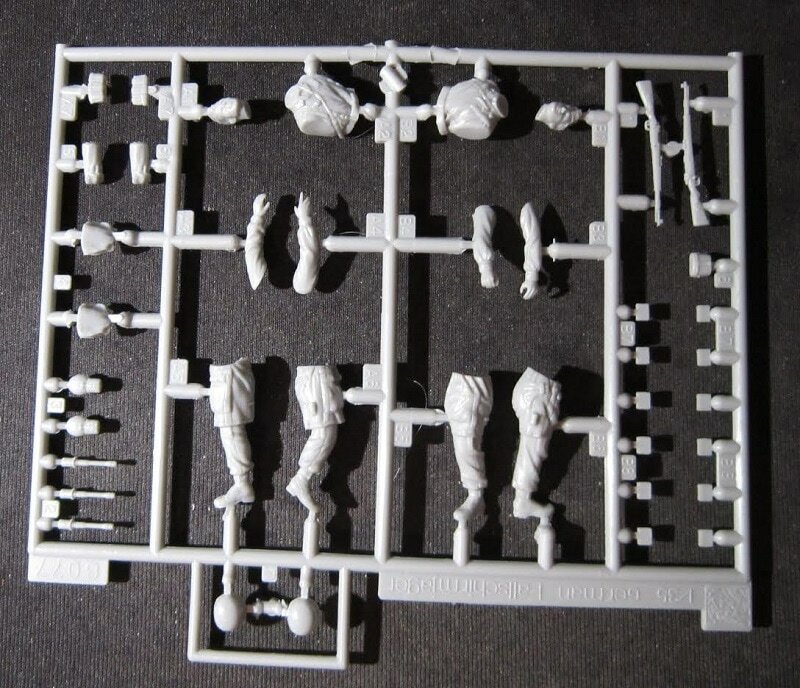 MSRP: $47.99 at Sprue Bros for rebox kit no. 6471. My kit has a copyright date of 1996 and cost $23.00 back then. Italeri is a older prolific model company based in Italy. 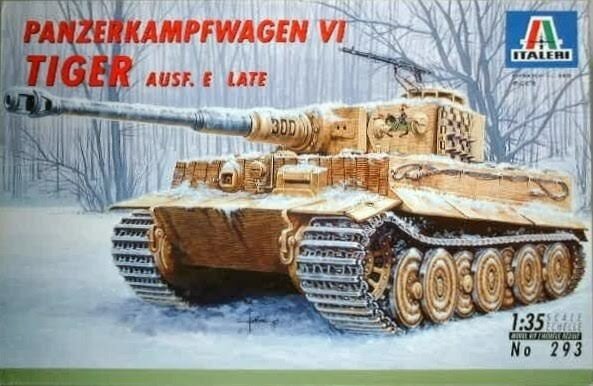 The box art shows a Tiger parked in a snow-covered forest clearing. It is in an overall base of earth yellow with an emblem of a knight on horseback in black on the turret and a large black number 300 on the base section of the main gun. One side panel has a one paragraph history of the tank in English, German, French, Italian, Spanish, Dutch and Norwegian. Each paragraph is labeled with a color illustration of the flag of the country that speaks those languages. The other side panel continues the histories in Polish, Japanese, Chinese and a language and flag that I don't recognize. 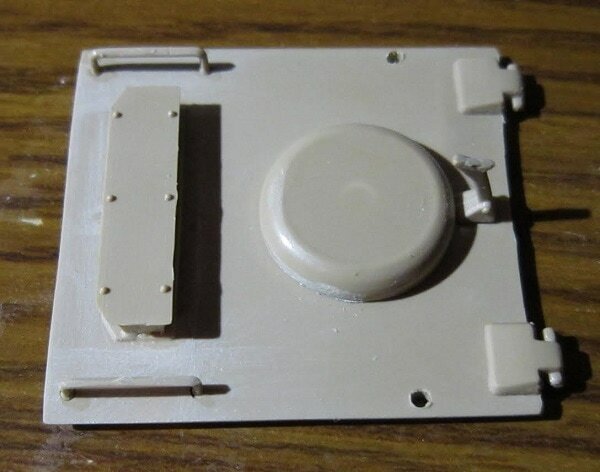 It says that the kit is not suitable for kids under 3 and is intended for modelers over 10. The copyright of the kit is 1996. 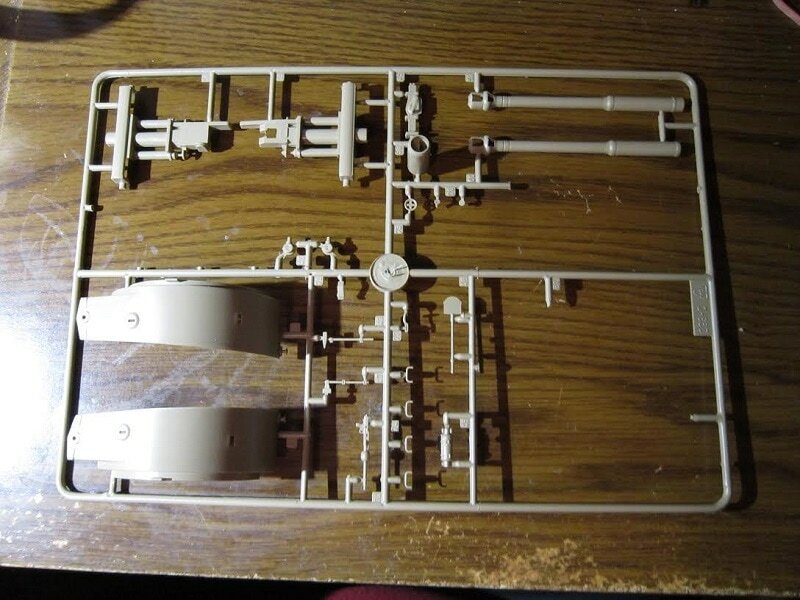 The kit contains 5 light-tan trees of parts, the decal sheet and the instructions. Parts trees are not cello bagged. The instructions consist of a single sheet that accordion-folds out into 10 pages in 8" x 13 1/2" page format. 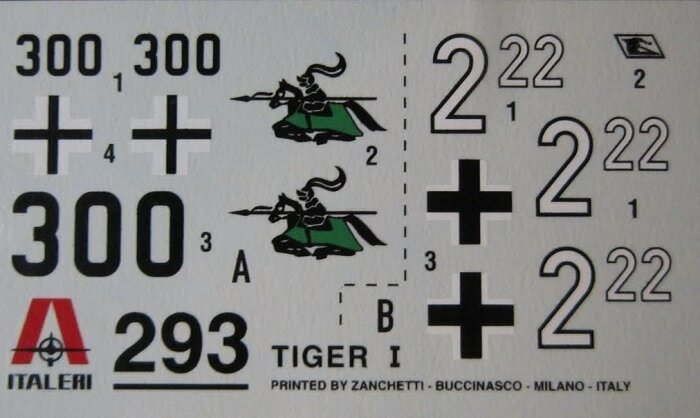 Page 1 of the instructions has the history of the Tiger in 12 languages, including English. Below that is decal application instructions in 8 languages, including English. Page 2 begins with "Attention - Useful Advice" in 10 languages, including English, over 3 illustrations of part trees letter A, D and C.
Page 3 has illustrations at the top of the two identical letter B trees, over a suggested color listing of Model Master brand paints. The first assembly step is at the bottom of the page. Page 4 through 9 give a grand total of 13 assembly steps. Page 10 has two 4-views of schemes. Both schemes are in overall earth-yellow and are labeled as being Tigers in the Winter of 1944 on the Eastern Front. However, no units are said. One scheme is the box art one. It shows here that there is a German cross on the turret side partially hidden under spare track. To the left of the track is the black knight on horseback logo. A large black no. 300 is on the sides of the base section of the main gun and on the back of the turret rear storage bin. The other scheme also shows the German cross hidden behind the spare track links on the turret side. To the left of the tracks is the no. 222 in white with black border. The first 2 is larger than the following other 22. This number appears on the back of the turret rear storage bin. No Division units are supplied. ​Tree letter C holds: the main gun parts, turret halves, ax, sledge hammer, MG, jack etc. (21 parts) Five parts are shown shaded out in the parts trees illustrations. They are not on the tree and were probably removed at the factory. The decals complete the kit contents. 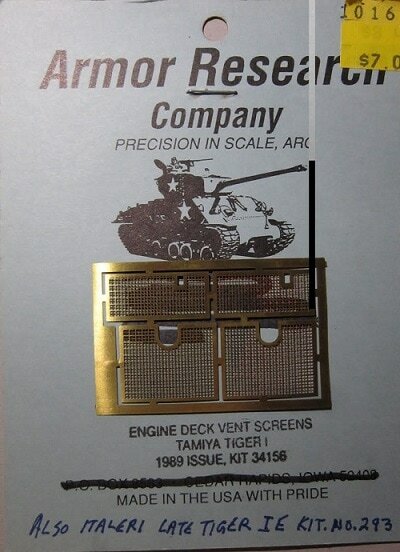 ​I am adding my company's (Armor Research) kit no. 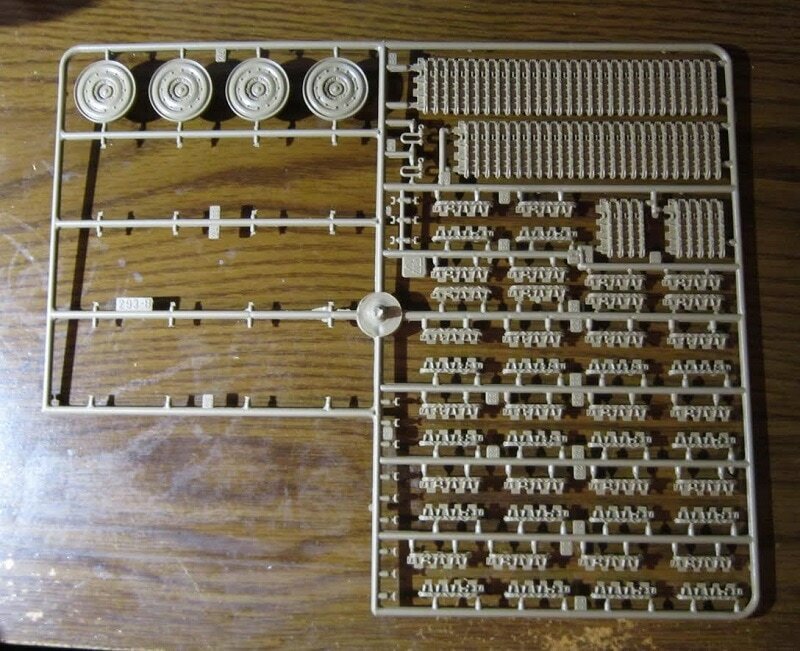 1016, a brass PE set of engine air intake screens to my kit. ​I have started assembly steps 1 through 7. In the 1st assembly I added the front and rear plates to the hull tub. 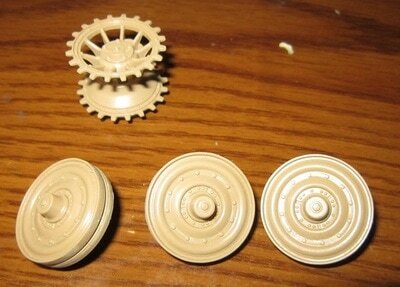 In the 2nd and 3rd assembly I attached the axles to the hull tub, glued road wheel halves together and the idler wheels. I left the outer row of road wheels off until painting later. ​These steps call for the link and length track to be added, but I left them off till after painting too. In the 4th assembly shows more track assembly. I skipped over it. 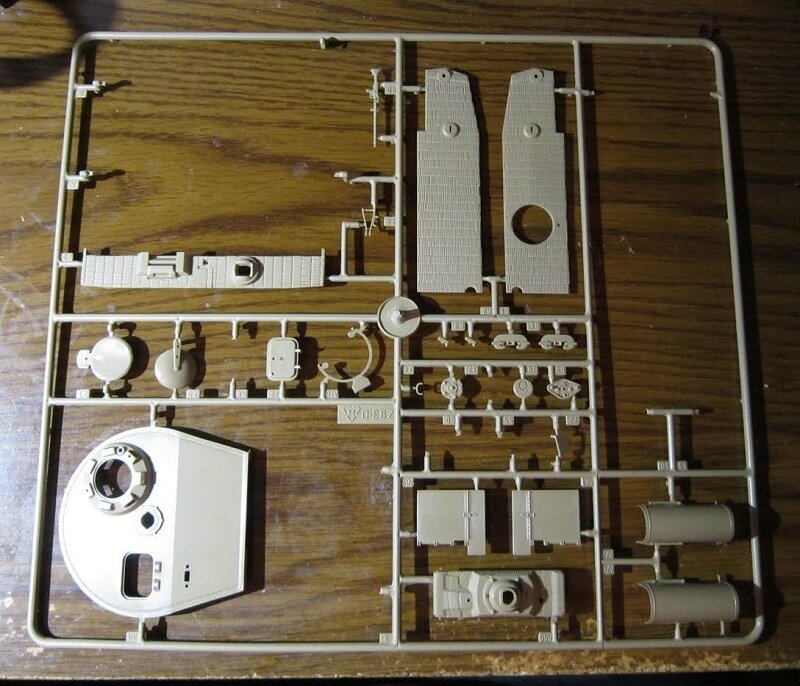 In the 5th and 6th assembly I assembled the engine in its compartment and put together the hinged hatches that go over the driver and gunner positions. 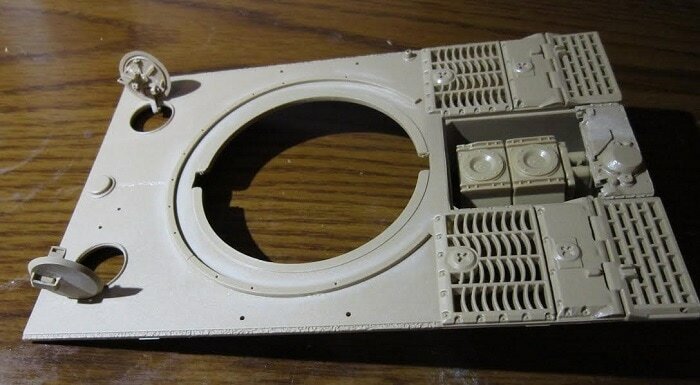 ​Finally, in the 7th assembly I added the round turret base to the top of the fighting compartment roof and the hatch to the engine compartment. This has been a pleasant build so far. 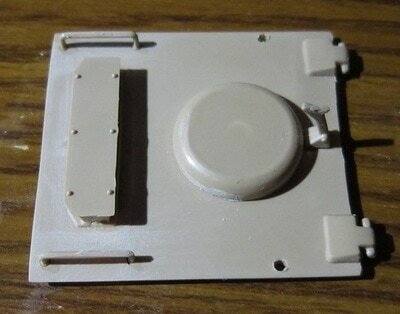 The external parts of this model have zimmerit molded into them. Neat!! 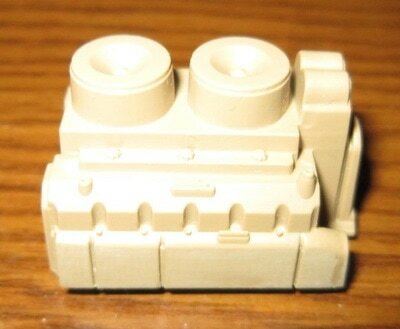 There is no interior detail in the hull tub, but the turret has a nicely detailed bun breech and other details inside. There are no crew figures in the kit. ​I purchased this kit at my local hobby shop back in the 90's.